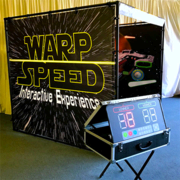 Warp Speed is out of this world FUN! This space themed game is a high impact, fast paced adventure. From the moment players enter the cubical, they are surrounded by colorful graphics, lights and sound effects. It is more than a game; it's an experience.